The regular meeting of the Wannabee Hobby Beekeepers was called to order at 6:00 p.m. on May 3, 2011 at the Canyon Lake Senior Center by Lee Alley. There were more than 50 people in attendance. Remember to come between 5:30 and 6:00 so members can socialize before the meeting starts. For this meeting, James Ann Barlean once again brought tasty treats — some delicious gluten free honey dessert treats baked by her mother who owns Cakes and More (located behind FedEx off St Patrick Street). Joan brought in some homemade bees wax lip balm. In January 2011, (and before Jerry offered to extract honey for beekeepers), the club had voted to raise membership dues from $5.00 to $15.00 for the 2011 year and to review the status at the end of 2011 to see if the dues should be set back to $5.00. Since there is not an immediate need for the club to raise funds to purchase an extractor, there has been discussion of lowering the club dues. Lee is putting together a volunteer task group of 3 people to review this item and bring their findings to the next club meeting for discussion/voting. If you are interested in being on this task force, please contact Lee at lee@leealleyrealestate.com or (605)863-0806. Membership Roster: Lee is in charge of the club membership roster. If you have changes that you want made to the roster or if you want your email address changed, added or removed, please send these requests to Lee at the above email address. Logo Challenge – We will vote on the club logo at the next meeting (June 8th). We had over 16 logo submissions and they are all very nice. Recipe Challenge – Some members thought it may be fun to put together a recipe book related to recipes that use honey. At the May meeting, Orchid volunteered to take on this task. Members are encouraged to e-mail recipes (along with your name) to orchid.nester@gmail.com Thank You Orchid !! Member Introductions – We had over 50 people at this meeting and Lee’s question of the night was ‘Why did you get into bees and what do your neighbors and family think about your hobby?’ There were people from the Badlands to Custer to Pine Ridge; Whitewood, Hill City, Silver City and all around the Rapid City area. These sessions are informative and fun and typically last about 30 minutes. The June 8th meeting seminar will be dedicated to Pests and Diseases of Bees & Bee Health. Lee is looking for expert volunteers for this seminar. If you are interested, contact Lee. Don Sargent bought his hive from a woman in Cheyenne Crossing about 10 years ago but he did not get bees until last year when his daughter Rita convinced him to get bees. Don has a 40 acre farm in Whitewood with acres of oak and pine trees as well as a garden and a fruit tree orchard where he has planted 8 rows of fruit trees (40 to 50 trees including apples, plum, and apricot). He has placed his hive in the fruit orchard and his bees (and apple trees) are doing very well. He planted his fruit trees over 10 years ago but last year was the first time he had apples which he attributes to his bees. His bees are normally very gentle but last fall (late September and October), the bees were more protective of their hive. Don’s hive sits on a pallet with the hive entrance facing east. To winter his bees, he removed the supers, put straw bales, stacked 2 high and wrapped in tarpaper, around 3 sides of the hive leaving about a 6 inch air space. He placed plywood across the top to keep snow/rain off and his bees wintered-over just fine. He did have some mice problems with mice getting into the hay but he put decon under the pallet and that took care of the problem. (Note that the Jerry Owens and his son said the bees will kill the mice if they enter the hive). Jerry gave a talk in Hot Springs recently where he met new club members, Larry and Margaret. Larry has severe rheumatoid arthritis and the medications for this were making him sicker. He has been off medications for 6 months and his arthritis is growing progressively worse. One doctor introduced him to the concept of treating his arthritis with bee venom. Larry visited Jerry at his home and Jerry put several honey bees in a jar and tried to aggravate them into stinging Larry on his very swollen knee. After 15 minutes – they could not get a bee angry enough to sting – but they eventually got one to do it. Jerry and his son said Larry’s knee was swollen to about the size of a cantaloupe before the bee stung him and within about 15 minutes after the sting, the swelling had gone down significantly. Larry is able to walk now without his cane and the treatment is supposed to last up to 6 weeks. As Larry says – he does not call it bee venom, he calls it bee ‘juice’ as it has helped him when no other options were available. Thanks for sharing such fascinating information and keep us updated !! May 21: Jerry Owens will be giving a talk during the Sturgis Earthfest Days (May 18 thru 21). Jerry is addressing the Canyon Lake Senior Center Garden Club on May 26th. He is also scheduled to do several middle-school talks in May. May 18: At noon on May 18th at the Rapid City Library, Lee Alley will be presenting the ‘Communication of Honey Bees’ — the same presentation he gave to the club last fall. This is an excellent session and if you get a chance and have not seen it, you should attend. It is very informative. The May 11th meeting seminar was all about Swarms and Capturing Swarms by Bob Steele. I forgot to get a picture of Bob – darn it !! Bob shared a lot of information and some great pictures he’s taken of swarms that he has captured over the years. Bob got started with swarms when Jerry Owens asked him to accompany him to capture a swarm; then Jerry went on vacation and left Bob in charge of swarms. Since then, he and his 9 year old grand-daughter have caught numerous swarms – so many that Bob is now known as the ‘Swarm Guy’. Bob said bees swarm for various reasons – one is when the hive gets crowded and the queen releases a pheromone telling the workers it’s time to leave. The workers will gorge on honey while the queen goes on a diet so she loses enough weight that she can fly. When she leaves, she takes a least half the workers with her and will typically travel 3 to 5 miles from the hive. Bob normally sees the swarms land on bushes or trees but he did catch a swarm at the Bodega in Hill City where the bees swarmed onto a wall outside the Bodega. He has also captured swarms in chimney’s as well as old cottonwood trees. One time a tree holding a hive was hit by lightening, causing the bees to swarm. Once the hive swarms, they need to find a new home within 3 to 5 days. The queen sends scouts to find a new home. When the scouts return to the swarm, they dance to tell the other bees what they have found and where. Once the scouts have revealed their possibilities, the bees decide which new home they want to go to and they leave to take up residence in the new home. Spray bottle with sugar water to calm the bees. If the bees have been at the same location for very long, they may have used up all of their honey and they may be more aggressive (called a Dry Swarm). The sugar water help calm and feed them. The main objective of capturing the swarm is to get the queen. The bees swarm around the queen into (usually) a tear-drop shaped ball with the queen in the middle. Bob carefully removes the entire swarm (if on a branch, he cuts the entire branch) and places it in the cardboard box and tapes it shut. He never leaves the swarm in the cardboard box for long; as soon as possible, he transfers the swarm to an empty hive and then just leaves them alone for a few days. It’s important to not disturb them. He ensures that they have adequate sun and shade as well as water and forage nearby. After a few days, he opens the hive and removes the branches and whatever other junk might be in the hive and places frames in the hive. He gives the new hive honey or sugar water and if he has any, drawn comb with honey. (He did say store-bought honey would work). When working a swarm, first make sure it is honey bees; then take your time and move slowly. A swarm (not counting the branches it landed on) weighs around 7 pounds. Bob has found the experience of catching swarms with his granddaughter to be very fulfilling and educational for them both. When he captures a swarm, first preference is given to bee club members. 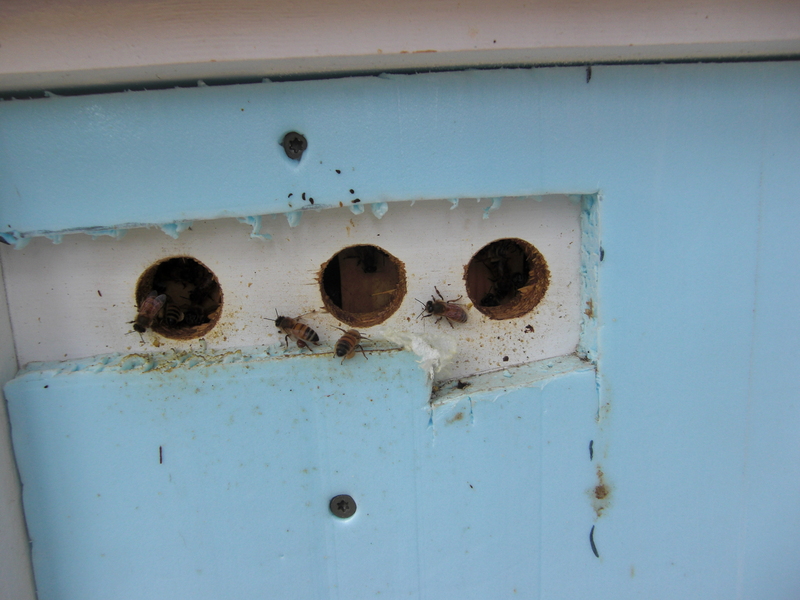 Ellen Conroy opened up her hive and it had a very foul smell. She discussed this problem with Jerry and they believe it may be American or European Foul Brood. As she finds out more information, she will let me know and I’ll post it on the site. See new website menu item called ‘Bee Diseases‘. This is where we will post new and updated information related to issues with our bees. And unfortunately, Lee lost one of his hives to nosema (an intra-cellular parasitic disease in bees caused by one of two (or both) fungi named Nosema apis and Nosema ceranae). When bees ingest the spores, it can weaken and kill them. Lee is not certain if his colony was weak and therefore was subject to the disease or of the disease weakened his bees. The following 2 pictures are from Lee to show other members what the evidence of Nosema looked like. 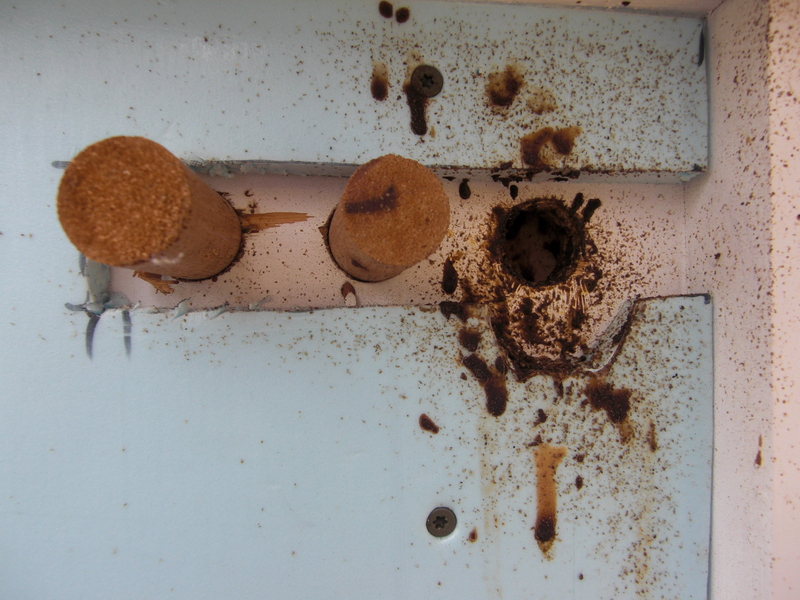 The picture on the left shows the front entrance of his healthy hive; the picture on the right shows the nosema-afflicted hive. Lee started noticing the ‘bee diarrhea’ last fall (note the color can change based on type of pollen the bees are currently finding). Had he realized that it was evidence of a serious problem, he could have treated the bees with a drenching accelerated treatment specifically for nosema and perhaps saved his bees. The June 8th meeting will be specifically targeted to teach beekeepers what to look for. Jerry and Bob are picking up the honey bees on Friday and will have them at Mary Hall Park (3233 W South Street) on Saturday, May 14 at Noon. Jerry is also providing a barbeque and encourages everyone to come and see 1.5 million bees in one place (96 NUC’s and 4 packages). Jerry thanked everyone for being part of the bee community and caring so much about the bees. Don’t forget to use the Questions and Answers section on the web site – that way members can answer your questions between meetings. Nicole gave the Treasurer Report at the end of the meeting. Since this newsletter is posted on-line, I do not include the actual dollar information here. This entry was posted in Archive - 2011 Minutes. Bookmark the permalink.